Singles' Day celebration is the biggest shopping day of the year. Alibaba just made e-commerce history. With the company's massive Singles' Day celebration on 11/11 — November 11 — coming to a close, Alibaba reports that customers spent $30.8 billion online over the last 24 hours. 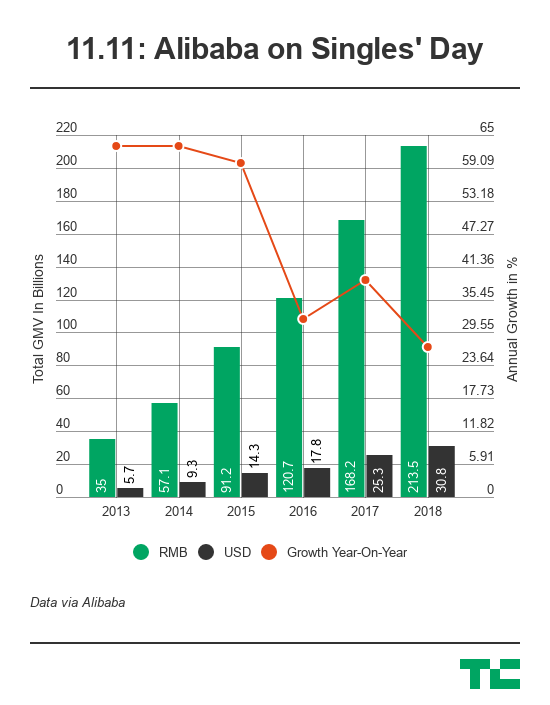 That is a significant increase from the $25.3 billion in gross merchandise volume (GMV) Alibaba shoppers spent in 2017. Alibaba's Singles' Day celebration is the biggest shopping day of the year, as the company dominates the Chinese e-commerce market. Shoppers — primarily in China, though the company is increasingly offering Singles' Day deals in new countries — flock to Alibaba sites including Taobao.com and Tmall.com. More than one billion delivery orders were placed over the course of the 24 hours, the first time Alibaba's Singles' Day sales surpassed the billion-package landmark. Last year, 812 million orders were placed on 11/11. "Everywhere I go, which is pretty much everywhere in the world, there are not very many people who do not know about 11/11," Alibaba's president, Michael Evans, told Business Insider in an interview on Sunday. "Many people ask the question — how can we participate next year? People are very interested, I think partly because they've heard of Black Friday and Cyber Monday and they think that's quite big." While not an exact match, Alibaba's Singles' Day is similar to Amazon's Prime Day in many ways. Both "holidays" were created or built up for pretty much the sole purpose of offering deals and pushing sales. However, Singles' Day is far larger than Prime Day. While Amazon does not release Prime Day sales figures, total online sales are estimated to have topped $4.2 billion over the company's 36-hour Prime Day event in July 2018, according to Wedbush Securities Inc. analyst Michael Pachter. Alibaba was crucial in making Singles' Day, previously an obscure holiday observed by just a handful of companies, a massive cultural phenomenon over the last decade. This is the 10th year that the company has celebrated 11/11. As the company celebrated a decade of Singles' Day, Alibaba executives emphasized the need to find new ways to continue to evolve, whether that means expanding in different regions or exploring new types of business. This year, more than 20 Alibaba-owned businesses including online shopping site Taobao, delivery platform Ele.me, and supermarket chain Hema participated in 11/11 deals. "Philosophically, how we look at whether we got into one business or another ... we never ask ourselves whether this is a lucrative area or whether it's going to be a commercially successful thing," Alibaba cofounder and executive vice chairman Joe Tsai told Business Insider. "We do things out of necessity and we do things out of fear," Tsai continued, citing Alibaba's 2003 launch of Taobao to shut down the threat of eBay expanding in China. "There's a high sense of paranoia within the company."